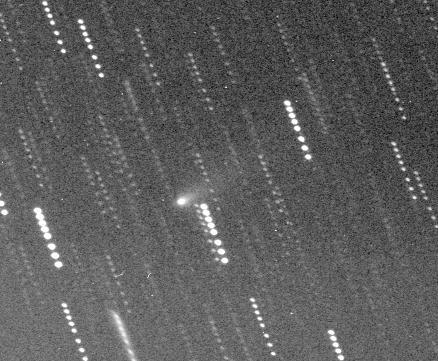 This image of Comet C/1999 D1 (LONEOS) was obtained on 1999 February 21 with Spacewatch, shortly after discovery. The image is 7.7 arcminutes wide by 6.3 arcminutes tall, North at top, West at left. This image is a sum of 8 - 143 second exposures, total effective exposure time 1147 seconds, or 19.1 minutes. Click on the thumbnail for the full view of the comet. Return to Jim's Comet page.